When mathematician Alexander Shnirelman arrived here last fall from Russia via Israel and England, he brought with him years of experience, not only in academia, but also in industry. 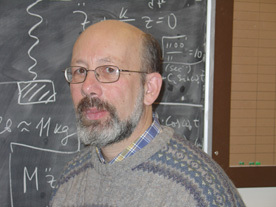 Professor Shnirelman now holds the Canada Research Chair in Applied Mathematics, in Concordia’s Department of Mathematics and Statistics. His main area of interest is the turbulent flow of fluids, a field that includes some of the last major unsolved problems in physics and mathematics. More than 300 graduates of Loyola College were given honorary Concordia certificates at a ceremony on March 30 in the Loyola Chapel. Before the merger with Sir George Williams University in 1974, Loyola graduates got their degrees through Université de Montréal because Loyola College lacked a university charter.